Replace Confederate monument with statue of Snooty the Manatee. National coverage and a big thank you. Jul 26, 2017 — I just want to take a moment and thank all 6,000 + of you who have shown your support so far and helped with getting the word out. Momentum is being gained at an astronomical pace and it wouldn't have happened without all of you. This story has made national headlines including BuzzFeed, The Huffington Post, and The Hill along with numerous local news stations. Having said that, I will wait until the end of this week just to see how many people we can get behind this cause and I will then submit it to the County Commission for consideration. The fact that this has gained THIS much support in such a short amount of time should at least warrant an audience with the decision makers in this area. Keep it up. You all are beautiful and Snooty would be proud. 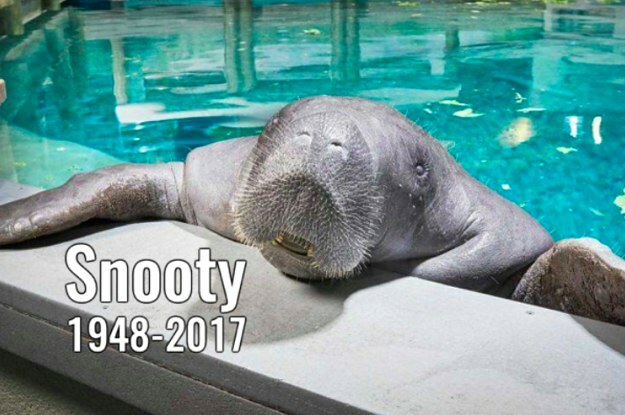 People were devastated by the loss of the manatee, who was a hometown hero in Bradenton, Florida. After hearing people talking about removing the local Confederate monument - something Pusateri called "a symbol of slavery, racism, bigotry, and divisiveness" - he thought it presented an opportunity to memorialize Snooty instead, a "positive symbol of what is good about the community," he said. Manatee County Commission: Replace Confederate monument with statue of Snooty the Manatee.